For other uses, see Tabernacle (disambiguation). According to the Hebrew Bible (Old Testament) the tabernacle (Hebrew: מִשְׁכַּן‎, mishkan, meaning "residence" or "dwelling place"), also known as the Tent of the Congregation, was the portable earthly dwelling place of Yahweh (God) used by the children of Israel from the Exodus until the conquest of Canaan. It was constructed of 4 woven layers of curtains and 48 15 foot tall standing wood boards overlayed in gold and held in place by its bars and silver sockets and was richly furnished with valuable materials taken from Egypt at Gods orders. Moses was instructed at Mount Sinai to construct and transport the tabernacle with the Israelites on their journey through the wilderness and their subsequent conquest of the Promised Land. After 440 years, Solomon's Temple in Jerusalem superseded it as the dwelling-place of God. The main source describing the tabernacle is the biblical Book of Exodus, specifically Exodus 25–31 and 35–40. Those passages describe an inner sanctuary, the Holy of Holies, created by the veil suspended by four pillars. This sanctuary contained the Ark of the Covenant, with its cherubim-covered mercy seat. An outer sanctuary (the "Holy Place") contained a gold lamp-stand or candlestick. On the south side stood a table, on which lay the showbread. On the north side was the Menorah, holding seven oil lamps to give light. On the west side, just before the veil, was the golden altar of incense. This description is generally identified as part of the Priestly source ("P"), written in the sixth or fifth century BCE. However while the first Priestly source takes the form of instructions, the second[who?] is largely a repetition of the first in the past tense, i.e., it describes the execution of the instructions. Many scholars contend that it is of a far later date than the time of Moses, and that the description reflects the structure of Solomon's Temple, while some hold that the description derives from memories of a real pre-monarchic shrine, perhaps the sanctuary at Shiloh. Traditional scholars contend that it describes an actual tabernacle used in the time of Moses and thereafter. According to historical criticism, an earlier, pre-exilic source, the Elohist ("E"), describes the tabernacle as a simple tent-sanctuary. The English word "tabernacle" is derived from the Latin tabernāculum meaning "tent" or "hut", which in ancient Roman religion was a ritual structure. In Greek, including the Septuagint, it is translated σκηνή (skēnē), itself a Semitic loanword meaning "tent." The word sanctuary is also used for the biblical tabernacle, as is the phrase "tent of meeting". The Hebrew word mishkan implies "dwell", "rest", or "to live in", that dwelt within this divinely ordained structure. Historical criticism has identified two accounts of the tabernacle in Exodus, a briefer Elohist account and a longer Priestly one. Traditional scholars believe the briefer account describes a different structure, perhaps Moses' personal tent. The Hebrew nouns in the two accounts differ, one is most commonly translated as "tent of meeting," while the other is usually translated as "tabernacle." Exodus 33:7-10 refers to "the tabernacle of the congregation", which was set up outside of camp with the "cloudy pillar" visible at its door. The people directed their worship toward this center. Historical criticism attributes this description to the Elohist source (E), which is believed to have been written about 850 BCE or later. The more detailed description of a tabernacle, located in Exodus chapters 25–27 and Exodus chapters 35–40, refers to an inner shrine (the most holy place) housing the ark and an outer chamber (holy place), with a six-branch seven-lamp menorah (lampstand), table for showbread, and altar of incense. An enclosure containing the sacrificial altar and bronze laver for the priests to wash surrounded these chambers. This description is identified by historical criticism as part of the Priestly source (P), written in the 6th or 5th century BCE. Some scholars believe the description is of a far later date than Moses' time, and that it reflects the structure of the Temple of Solomon; others hold that the passage describes a real pre-monarchic shrine, perhaps the sanctuary at Shiloh, while traditional scholars contend that it describes an actual tabernacle used in the time of Moses and thereafter. This view is based on Exodus 36, 37, 38 and 39 that describe in full detail how the actual construction of the tabernacle took place during the time of Moses. Exodus 25: Materials needed: the Ark, the table for 12 showbread, the menorah. Exodus 26: The tabernacle, the bars, partitions. Exodus 27: The copper altar, the enclosure, oil. Exodus 28: Vestments for the priests, ephod garment, ring settings, the breastplate, robe, head-plate, tunic, turban, sashes, pants. Exodus 29: Consecration of priests and altar. Exodus 30: Incense altar, washstand, anointing oil, incense. In Exodus 31, the main builder and maker of the priestly vestments is specified as Bezalel, son of Uri son of Hur of the tribe of Judah, who was assisted by Aholiab and a number of skilled artisans. There is a strict set of rules to be followed for the carriage of the tabernacle laid out in the Hebrew Bible. For example: "You must put the Levites in charge of the tabernacle of the Covenant, along with its furnishings and equipment. They must carry the tabernacle and its equipment as you travel, and they must care for it and camp around it. Whenever the Tabernacle is moved, the Levites will take it down and set it up again. Anyone else who goes too near the tabernacle will be executed.'" (Numbers 1:48-51 NLT). As well, individuals with the Tzaraat skin affliction were not permitted entry to the tabernacle. The tabernacle during the Exodus, the wandering in the desert and the conquest of Canaan was in part a portable tent, and in part a wooden enclosure draped with ten curtains, of indigo (tekhelet תְּכֵלֶת), purple (argaman אַרְגָּמָן), and scarlet (shani שָׁנִי) fabric. It had a rectangular, perimeter fence of fabric, poles and staked cords. This rectangle was always erected when the Israelite tribes would camp, oriented to the east as the east side had no frames. In the center of this enclosure was a rectangular sanctuary draped with goat-hair curtains, with the roof made from rams' skins. Top view, parallel projection of tabernacle. The door of the tabernacle marked a ritual boundary: an Israelite healed of tzaraath would be presented by the priest who had confirmed his healing 'at the door of the tabernacle of Meeting', and a woman healed of prolonged menstruation would present her offering (two turtledoves or two young pigeons) to the priest 'at the door of the tabernacle of Meeting'. It was at the door of the tabernacle that the community wept in sorrow when all the men who had joined in worship to Baal of Peor were condemned to death. Dust from the floor of the tabernacle was mixed with water to create the ordeal of the bitter water for a suspected adulteress. After the conquest and division of the land among the tribes, the tabernacle was moved to Shiloh in Ephraimite territory (Joshua's tribe) to avoid disputes among the other tribes (Joshua 18:1; 19:51; 22:9; Psalm 78:60). It remained there during the 300-year period of the biblical judges (the rules of the individual judges total about 350 years [1 Kings 6:1; Acts 13:20], but most ruled regionally and some terms overlapped). According to Judges 20:26-28, the Ark, and thus possibly the tabernacle, was at Bethel while Phinehas, grandson of Aaron, was still alive. The subsequent history of the structure is separate from that of the Ark of the Covenant. After the Ark was captured by the Philistines, King Saul moved the tabernacle to Nob, near his home town of Gibeah, but after he massacred the priests there (1 Samuel 21-22), it was moved to Gibeon. (1 Chronicles 16:39; 21:29; 2 Chronicles 1:2-6, 13). Just prior to David's moving the ark to Jerusalem, the ark was located in Kiriath-Jearim (1 Chronicles 13:5-6). 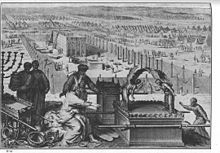 There is no mention of the tabernacle in the Tanakh after the destruction of Jerusalem and the Temple by the Babylonians in c. 587 BCE. Some rabbis have commented on the proximity of the narrative of the tabernacle with that of the episode known as the sin of the golden calf recounted in Exodus 32:1-6. Maimonides asserts that the tabernacle and its accoutrements, such as the golden Ark of the Covenant and the golden Menorah were meant as "alternates" to the human weakness and needs for physical idols as seen in the golden calf episode. Other scholars, such as Nachmanides disagree and maintain that the tabernacle's meaning is not tied in with the golden calf, but instead symbolizes higher mystical lessons that symbolize God's constant closeness to the Children of Israel. Synagogue construction over the last two thousand years has followed the outlines of the original tabernacle. Every synagogue has at its front an ark, aron kodesh, containing the Torah scrolls, comparable to the Ark of the Covenant which contained the tablets with Ten Commandments. This is the holiest spot in a synagogue, equivalent to the Holy of Holies. There is also usually a constantly lighted lamp, Ner tamid, or a candelabrum, lighted during services, near a spot similar to the position of the original Menorah. At the center of the synagogue is a large elevated area, known as the bimah, where the Torah is read. This is equivalent to the tabernacle's altars upon which incense and animal sacrifices were offered. On the main holidays the priests gather at the front of the synagogue to bless the congregation as did their priestly ancestors in the tabernacle from Aaron onwards (Numbers 6:22-27). 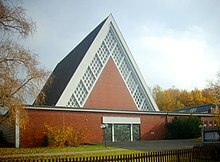 Some Christian churches are built like a tent, to symbolize the tent of God with men, including St. Matthew Cathedral, São Mateus, Brazil, and Zu den heiligen Engeln (To the Holy Angels), Hanover, Germany. The tabernacle is mentioned several times in the Epistle to the Hebrews in the New Testament. For example, according to Hebrews 8:2-5 and 9:2-26 Jesus serves as the true climactic high priest in heaven, the true tabernacle, to which its counterpart on earth was a symbol and foreshadow of what was to come (Hebrews 8:5). In the Islamic tradition, the tabernacle can relate to the Kaaba in Mecca, Saudi Arabia. Muslims believe this to be the House of God and the epicentre to which their entire population prays towards as one unified body. ^ a b c d e f g h i j Cross, F. L., ed. (2005). "Tabernacle". The Oxford Dictionary of the Christian Church. New York: Oxford University Press. Singer, Isidore; et al., eds. (1901–1906). "Tabernacle". The Jewish Encyclopedia. 19 (2nd ed.). New York: Funk & Wagnalls. p. 419. This article incorporates text from a publication now in the public domain: Souvay, Charles Léon (1913). "Tabernacle" . In Herbermann, Charles (ed.). Catholic Encyclopedia. New York: Robert Appleton. ^ Fowler, William Warde (1922). The Religious Experience of the Roman People. London. p. 209. ^ Scheid, John (2003). An Introduction to Roman Religion. Indiana University Press. pp. 113–114. ^ Linderski, Jerzy (1986). "The Augural Law". Aufstieg und Niedergang der römischen Welt. II (16). pp. 2164–2288. ^ "Mishkan". Strong's Concordance. Retrieved 11 October 2018. ^ Harris, Stephen L. (1985). Understanding the Bible. Palo Alto: Mayfield. p. 48. ^ Miller, Rabbi Avigdor (1991). A Nation is Born: Comments and Notes on Shmos. Israel Bookshop Publications. p. 231. OCLC 25242329. ^ Confraternity of Christian Doctrine, Washington, D.C., translators, ed. (1987). The New American Bible, Old Testament. Catholic Book Publishing Co., New York, N.Y. p. 236. CS1 maint: Multiple names: authors list (link) CS1 maint: Extra text: authors list (link), The Book of Judges, prefatory notes: "...The twelve judges of the present book, however, very probably exercised their authority, sometimes simultaneously, over one or another tribe of Israel, never over the entire nation." ^ Chad Brand; Charles Draper; Archie England, eds. (2003). Holman Illustrated Bible Dictionary. Holman Bible Publishers, Nashville, Tennessee. pp. 961–965 "Judges, Book of". : "Because of the theological nature of the narrative and the author's selective use of data, it is difficult to reconstruct the history of Israel during the period of the judges from the accounts in the heart of the book (3:7-16:31)." ^ Maimonides (Rambam) Rabbi Mosheh ben Maimon (c. 1190) Delalatul Ha'yreen (Arabic), Moreh Nevukhim (Hebrew), Guide for the Perplexed, Part 3:32, Part 11:39, Part 111:46. ^ Naḥmanides (Ramban) Rabbi Moses ben Naḥman Girondi Bonastruc ça (de) Porta (c. 1242) Bi'ur, or Perush 'al ha-Torah, Commentary on the Torah, Exodus 25:1 and Exodus Rabbah 35a. This article incorporates text from a publication now in the public domain: Walter Drum (1913). "Synagogue" . In Herbermann, Charles (ed.). Catholic Encyclopedia. New York: Robert Appleton. John J. Tierney (1913). "High Priest" . In Herbermann, Charles (ed.). Catholic Encyclopedia. New York: Robert Appleton. ^ Anders, Johanna (2014). Neue Kirchen in der Diaspora (in German). Kassel University Press. pp. 102–103. ISBN 978-3-86-219682-1. ^ Lings, Martin (2017). Muhammad his life based on the earliest sources. Turkey: Islamic Texts Society. p. 4. ISBN 978-0892810468. Wikimedia Commons has media related to Tabernacles. 3D Model of the Tabernacle and all internal components.